1926 - Amanullah proclaims himself king and attempts to introduce social reforms leading to opposition from conservative forces. 1929 - Amanullah flees after civil unrest over his reforms. 1933 - Zahir Shah becomes king and Afghanistan remains a monarchy for next four decades. 1953 - General Mohammed Daud becomes prime minister. Turns to Soviet Union for economic and military assistance. Introduces a number of social reforms, such as abolition of purdah (practice of secluding women from public view). 1963 - Mohammed Daud forced to resign as prime minister. 1964 - Constitutional monarchy introduced - but leads to political polarisation and power struggles. 1973 - Mohammed Daud seizes power in a coup and declares a republic. Tries to play off USSR against Western powers. His style alienates left-wing factions who join forces against him. 1978 - General Daud is overthrown and killed in a coup by leftist People's Democratic Party. But party's Khalq and Parcham factions fall out, leading to purging or exile of most Parcham leaders. At the same time, conservative Islamic and ethnic leaders who objected to social changes begin armed revolt in countryside. 1979 - Power struggle between leftist leaders Hafizullah Amin and Nur Mohammed Taraki in Kabul won by Amin. Revolts in countryside continue and Afghan army faces collapse. Soviet Union finally sends in troops to help remove Amin, who is executed. 1980 - Babrak Karmal, leader of the People's Democratic Party Parcham faction, is installed as ruler, backed by Soviet troops. But anti-regime resistance intensifies with various mujahideen groups fighting Soviet forces. US, Pakistan, China, Iran and Saudi Arabia supply money and arms. 1985 - Mujahideen come together in Pakistan to form alliance against Soviet forces. Half of Afghan population now estimated to be displaced by war, with many fleeing to neighbouring Iran or Pakistan. New Soviet leader Mikhail Gorbachev says he will withdraw troops from Afghanistan. 1986 - US begins supplying mujahideen with Stinger missiles, enabling them to shoot down Soviet helicopter gunships. Babrak Karmal replaced by Najibullah as head of Soviet-backed regime. 1988 - Afghanistan, USSR, the US and Pakistan sign peace accords and Soviet Union begins pulling out troops. 1989 - Last Soviet troops leave, but civil war continues as mujahideen push to overthrow Najibullah. 1991 - US and USSR agree to end military aid to both sides. 1992 - Resistance closes in on Kabul and Najibullah falls from power. Rival militias vie for influence. 1993 - Mujahideen factions agree on formation of a government with ethnic Tajik, Burhanuddin Rabbani, proclaimed president. 1994 - Pashtun-dominated Taliban emerge as major challenge to the Rabbani government. 1996 - Taliban seize control of Kabul and introduce hard-line version of Islam, banning women from work, and introducing Islamic punishments, which include stoning to death and amputations. Rabbani flees to join anti-Taliban northern alliance. 1997 - Taliban recognised as legitimate rulers by Pakistan and Saudi Arabia. Most other countries continue to regard Rabbani as head of state. Taliban now control about two-thirds of country. 1998 - Earthquakes kill thousands of people. US launches missile strikes at suspected bases of militant Osama bin Laden, accused of bombing US embassies in Africa. 1999 - UN imposes an air embargo and financial sanctions to force Afghanistan to hand over Osama bin Laden for trial. 2001 January - UN imposes further sanctions on Taliban to force them to hand over Osama bin Laden. 2001 March - Taliban blow up giant Buddha statues in defiance of international efforts to save them. 2001 April - Mullah Mohammad Rabbani, the second most powerful Taliban leader after the supreme commander Mullah Mohammad Omar, dies of liver cancer. 2001 May - Taliban order religious minorities to wear tags identifying themselves as non-Muslims, and Hindu women to veil themselves like other Afghan women. 2001 September - Eight foreign aid workers on trial in the Supreme Court for promoting Christianity. This follows months of tension between Taliban and aid agencies. 2001 - Ahmad Shah Masood, legendary guerrilla and leader of the main opposition to the Taliban, is killed, apparently by assassins posing as journalists. 2001 October - US, Britain launch air strikes against Afghanistan after Taliban refuse to hand over Osama bin Laden, held responsible for the September 11 attacks on America. 2001 November - Opposition forces seize Mazar-e Sharif and within days march into Kabul and other key cities. 2001 5 December - Afghan groups agree deal in Bonn for interim government. 2001 7 December - Taliban finally give up last stronghold of Kandahar, but Mullah Omar remains at large. 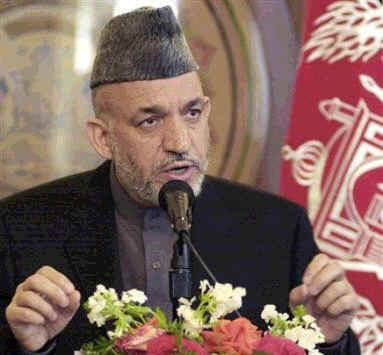 2001 22 December - Pashtun royalist Hamid Karzai is sworn in as head of a 30-member interim power-sharing government. 2002 January - First contingent of foreign peacekeepers in place. 2002 April - Former king Zahir Shah returns, but says he makes no claim to the throne. 2002 May - UN Security Council extends mandate of International Security Assistance Force (Isaf) until December 2002. Allied forces continue their military campaign to find remnants of al-Qaeda and Taliban forces in the south-east. 2002 June - Loya Jirga, or grand council, elects Hamid Karzai as interim head of state. Karzai picks members of his administration which is to serve until 2004. 2002 July - Vice-President Haji Abdul Qadir is assassinated by gunmen in Kabul. 2002 September - Karzai narrowly escapes an assassination attempt in Kandahar, his home town. 2002 December - President Karzai and Pakistani, Turkmen leaders sign deal to build gas pipeline through Afghanistan, carrying Turkmen gas to Pakistan. 2003 August - Nato takes control of security in Kabul, its first-ever operational commitment outside Europe. 2004 January - Grand assembly - or Loya Jirga - adopts new constitution which provides for strong presidency. 2004 March - Afghanistan secures $8.2bn (£4.5bn) in aid over three years. 2004 September - Rocket fired at helicopter carrying President Karzai misses its target; it is the most serious attempt on his life since September 2002. 2004 October-November - Presidential elections: Hamid Karzai is declared the winner, with 55% of the vote. He is sworn in, amid tight security, in December. 2005 February - Several hundred people are killed in the harshest winter weather in a decade. 2005 May - Details emerge of alleged prisoner abuse by US forces at detention centres. 2005 September - First parliamentary and provincial elections in more than 30 years. 2005 December - New parliament holds its inaugural session. 2006 February - International donors meeting in London pledge more than $10bn (£5.7bn) in reconstruction aid over five years. 2006 May - Violent anti-US protests in Kabul, the worst since the fall of the Taliban in 2001, erupt after a US military vehicle crashes and kills several people. 2006 May-June - Scores of people are killed in battles between Taliban fighters and Afghan and coalition forces in the south during an offensive known as Operation Mountain Thrust. 2006 July onwards - Nato troops take over the leadership of military operations in the south. Fierce fighting ensues as the forces try to extend government control in areas where Taliban influence is strong. 2006 October - Nato assumes responsibility for security across the whole of Afghanistan, taking command in the east from a US-led coalition force. 2007 March - Pakistan says it has arrested Mullah Obaidullah Akhund, the third most senior member of the Taliban's leadership council. Nato and Afghan forces launch Operation Achilles, said to be their largest offensive to date against the Taliban in the south. There is heavy fighting in Helmand province. Controversy over Italian deal with Taliban, which secures the release of five rebels in exchange for kidnapped reporter Daniele Mastrogiacomo. His Afghan driver and translator are beheaded. 2007 May - Taliban's most senior military commander, Mullah Dadullah, is killed during fighting with US, Afghan forces. Afghan and Pakistani troops clash on the border in the worst violence in decades in a simmering border dispute. 2007 July - Former king Zahir Shah dies. A group of South Korean Christian charity workers is kidnapped by the Taliban. Two are killed, the rest are freed over the next six weeks. 2007 August - Opium production has soared to a record high, the UN reports. 2007 October - Fifteen are put to death in the second confirmed set of executions since the fall of the Taliban in 2001. 2007 November - A suicide attack on a parliamentary delegation kills at least 41 in northern town of Baghlan, in the country's worst such attack. 2007 December - Two senior EU and UN envoys are accused by Afghan officials of making contact with the Taliban and expelled from the country. 2008 February - Prince Harry, third in line to the British throne, is pulled out of Afghanistan after serving 10 weeks in action in Helmand province. 2008 April - Nato leaders meeting in Bucharest say peacekeeping mission in Afghanistan is their top priority. They pledge a "firm and shared long-term commitment" there. 2008 June - Taliban engineers massive jail-break from Kandahar prison, freeing at least 350 insurgents. British Defence Secretary Des Browne announces British troop numbers in Afghanistan to increase by 230 to new high of more than 8,000 by spring 2009. President Karzai warns that Afghanistan will send troops into Pakistan to fight militants if Islamabad fails to take action against them. 2008 July - Suicide bomb attack on Indian embassy in Kabul kills more than 50. Afghan government accuses Pakistani intelligence of being behind this and other recent miltant attacks. Pakistan denies any involvement. 2008 August - Ten French soldiers killed in an ambush by Taliban fighters. President Karzai accuses Afghan and US-led coalition forces of killing at least 89 civilians in an air strike in the western province of Herat. He later sacks two senior military commanders over the strike. 2008 September - President Bush sends an extra 4,500 US troops to Afghanistan, in a move he described as a "quiet surge". 2008 October - Germany extends Afghanistan mission to 2009 and boosts troop numbers in Afghanistan by 1,000, to 4,500. 2008 November - Taliban militants reject an offer of peace talks from President Karzai, saying there can be no negotiations until foreign troops leave Afghanistan. 2008 December - President Karzai and new Pakistani President Asif Ali Zardari agree to form joint strategy to fight militants operating in their border regions. 2009 January - Kyrgyzstan decides to close US air base at Manas that supplies troops and materiel to Afghanistan. US Defence Secretary Robert Gates tells Congress that Afghanistan is new US administration's "greatest test". 2009 February - Up to 20 Nato countries pledge to increase military and other commitments in Afghanistan after USA announces dispatch of 17,000 extra troops. 2009 March - President Barack Obama unveils a new US strategy for Afghanistan and Pakistan to combat what he calls an increasingly perilous situation. An extra 4,000 US personnel will train and bolster the Afghan army and police, and there will also be support for civilian development. 2009 May - US Defence Secretary Robert Gates replaces commander of US forces in Afghanistan, Gen David McKiernan, with Gen Stanley McChrystal, saying the battle against the Taliban needs "new thinking". US military says a US-Afghan force arrested 60 militants and captured more than 100 tonnes of drugs in Helmand province, in the largest drug seizure since foreign troops arrived in 2001. 2009 July - US army launches major offensive against the Taliban's heartland in southern Helmand province, involving about 4,000 Marines and 650 Afghan soldiers. 2009 August - Presidential and provincial elections are held, but are marred by widespread Taliban attacks, patchy turnout and claims of serious fraud. 2009 September - Leaked report by the commander of US forces, Gen Stanley McChrystal, says the war against the Taliban could be lost within 12 months unless there are significant increases in troop numbers. 2009 October - Hamid Karzai is declared winner of the August presidential election, after second-placed opponent Abdullah Abdullah pulls out before the second round. Preliminary results had given Mr Karzai 55% of the vote, but so many ballots are found to be fraudulent that a run-off was called. The British government says it will send 500 more military personnel to Afghanistan. 2009 November - Hamid Karzai is sworn in for a second term as president. 2009 December - US President Barack Obama decides to boost US troop numbers in Afghanistan by 30,000, bringing total to 100,000. He also says the United States will begin withdrawing its forces by 2011. An Al-Qaeda double agent kills seven CIA agents in a suicide attack on a US base in Khost. 2010 January - Parliament rejects 17 of President Karzai's first list 24 cabinet nominees. In a further vote, MPs reject 10 of Mr Karzai's second list of 17 nominations. Taliban gunmen and suicide bombers carry out a bold attack on civilian and government buildings in central Kabul. The fighting leaves 12 people dead, including seven militants. 2010 February - Nato-led forces launch major offensive, Operation Moshtarak, in bid to secure government control of southern Helmand province. President Karzai angers Western diplomats by issuing a decree giving him total control of the UN-backed Electoral Complaints Commission, which helped expose massive fraud in the October presidential election. 2010 April - President Karzai says that foreign observers were responsible for fraud in last year's disputed poll, and accuses UN and EU officials of involvement in a plot to put a puppet government in power. The White House calls his remarks "genuinely troubling". 2010 July - Major international conference endorses President Karzai's timetable for control of security to be transferred from foreign to Afghan forces by 2014. Whistleblowing website Wikileaks publishes thousands of classified US military documents relating to Afghanistan. General David Petraeus takes command of US, ISAF forces. 2010 August - Dutch troops quit. President Karzai says private security firm must cease operations by mid-December. He subsequently waters down the decree. 2010 September - Parliamentary polls marred by Taliban violence, widespread fraud and a long delay in announcing the results. 2010 November - Nato agrees plan to hand control of security to Afghan forces by end of 2014. 2011 January - President Karzai makes first official state visit to Russia by an Afghan leader since the end of the Soviet invasion in 1989. 2011 February - Number of civilians killed since the 2001 invasion hit record levels in 2010, Afghanistan Rights Monitor reports. 2011 April - Burning of Koran by a US pastor prompts country-wide protests in which foreign UN workers and several Afghans are killed. Some 500 mostly Taliban prisoners break out of prison in Kandahar. 2011 July - President's half-brother and Kandahar governor Ahmad Wali Karzai is killed in Taliban campaign against prominent figures. 2011 September - Ex-president Burhanuddin Rabbani - a go-between in talks with the Taliban - is assassinated. 2011 October - As relations with Pakistan worsen after a series of attacks, Afghanistan and India sign a strategic partnership to expand co-operation in security and development. 2011 November - President Karzai wins the endorsement of tribal elders to negotiate a 10-year military partnership with the US at a loya jirga traditional assembly. The proposed pact will see US troops remain after 2014, when foreign troops are due to leave the country. 2011 December - At least 58 people are killed in twin attacks at a Shia shrine in Kabul and a Shia mosque in Mazar-i-Sharif. Pakistan and the Taleban boycott the scheduled Bonn Conference on Afghanistan. Pakistan refuses to attend after a Nato air strike killed Pakistani soldiers on the Afghan border. 2012 January - Taliban agree to open office in Dubai as a move towards peace talks with the US and the Afghan government. 2012 February - At least 30 people are killed in protests about the burning of copies of the Koran at the US Bagram airbase. US officials believed Taliban prisoners were using the books to pass messages, and that they were extremist texts not Korans. Two soldiers are also killed in reprisal attacks. 2012 March - US Army Sgt Robert Bales is accused of killing 16 civilians in an armed rampage in the Panjwai district of Kandahar. 2012 April - Taliban announce "spring offensive" with audacious attack on the diplomatic quarter of Kabul. The government blamed the Haqqani Network. Security forces kill 38 militants. 2012 May - Nato summit endorses the plan to withdraw foreign combat troops by the end of 2014. New French President Francois Hollande says France will withdraw its combat mission by the end of 2012 - a year earlier than planned. Arsala Rahmani of the High Peace Council is shot dead in Kabul. A former Taliban minister, he was crucial in reaching out to rebel commanders. The Taliban deny responsibility. 2012 July - Tokyo donor conference pledges $16bn in civilian aid to Afghanistan up to 2016, with US, Japan, Germany and UK supplying bulk of funds. Afghanistan agrees to new conditions to counter corruption. 2012 August - The US military discipline six soldiers for accidentally burning copies of the Koran and other religious texts in Afghanistan. They will not face criminal prosecution. Three US Marines are also disciplined for a video in which the bodies of dead Taliban fighters were urinated on. 2012 September - US hands over Bagram high-security jail to the Afghan government, although it retains control over some foreign prisoners until March 2013. The US also suspends training new police recruits in order to carry out checks on possible ties to Taliban following series of attacks on foreign troops by apparent police and Afghan soldiers. 2013 February - President Karzai and Pakistan's Asif Ali Zardari agree to work for an Afghan peace deal within six months after talks hosted by Britain's Prime Minister David Cameron. They back the opening of an Afghan office in Doha and urge the Taliban to do the same for talks to take place. 2013 March - Two former Kabul Bank chiefs, Sherkhan Farnood and Khalilullah Ferozi, are jailed for the multi-million dollar fraud that almost led to its collapse and that of the entire Afghan banking system in 2010. 2013 June - Afghan army takes command of all military and security operations from Nato forces. President Karzai suspends security talks with the US after Washington announces it plans to hold direct talks with the Taliban. Afghanistan insists on conducting the talks with the Taliban in Qatar itself. 2014 January - Taliban suicide squad hits a restaurant in Kabul's diplomatic quarter, the worst attack on foreign civilians since 2001. The 13 foreign victims include IMF country head. 2014 April - The presidential election produces an inconclusive result and goes on to a second round between Abdullah Abdullah and Ashraf Ghani. 2014 June - Second round of presidential election is held, with more than 50 reported killed in various incidents during the vote. 2014 July - Election officials begin recount of all votes cast in June's presidential run-off, as part of a US-mediated deal to end dispute between candidates over widespread claims of fraud. 2014 September - The two rivals for the Afghan presidency, Ashraf Ghani and Abdullah Abdullah, sign a power-sharing agreement, following a two-month audit of disputed election results. Ashraf Ghani is sworn in as president. 2014 October - The US and Britain end their combat operations in Afghanistan. 2014 December - NATO formally ends its 13-year combat mission in Afghanistan, handing over to Afghan forces. Despite the official end to Isaf's combat role, violence persists across much of the country, with 2014 said to be the bloodiest year in Afghanistan since 2001. 2015 January - NATO-led follow-on mission "Resolute Support" gets underway, with some 12,000 personnel to provide further training and support for Afghan security forces. Islamic State (IS) group emerges in eastern Afghanistan and within a few months captures a large swathe of Taliban-controlled areas in Nangarhar province. 2015 March - US President Barack Obama announces that his country will delay its troop withdrawal from Afghanistan, following a request from President Ashraf Ghani. The lynching of a woman wrongly accused of burning a Koran in Kabul provokes widespread revulsion and criticism of hard-line clerics. Police face accusations of doing too little to save her. The incident leads to widespread protests against the treatment of women. Four men are later convicted of murder. 2015 May - Taliban representatives and Afghan officials hold informal peace talks in Qatar. Both sides agree to continue the talks at a later date, though the Taliban insist they will not stop fighting until all foreign troops leave the country. 2015 July - Taliban admits that reclusive founder, Mullah Omar, died a few years ago, and appoints Mullah Akhter Mansour as his replacement. 2015 September - Taliban briefly capture major northern city of Kunduz in their most significant advance since being forced from power in 2001. 2015 October - Powerful earthquake kills more than 80 people in northeast of country. 2015 October - US President Barack Obama announces that 9,800 US troops will remain in Afghanistan until the end of 2016, backtracking on an earlier pledge to pull all but 1,000 troops from the country. 2015 November - A new Taliban splinter group, headed by Mullah Rasool, announces its presence in southern Afghanistan. However, the group is totally crushed by the mainstream Taliban by spring 2016. 2015 December - Taliban make bid to capture Sangin, a town and district in Helmand Province. US warplanes deploy in support of Afghan security forces' attempt to repel insurgents. 2015 December - NATO extends its "Resolute Support" follow-on mission by 12 months to the end of 2016. 2016 - Over one million Afghans are on the go during the year, either due to internal displacement because of the war, or are forced to repatriate by Pakistan, Iran and the European Union, according to the United Nations. Heavy US air strikes reverse Islamic State's gains in the east, and the group is cornered in a few districts in Nangarhar. 2016 May - New Taliban leader Mullah Mansour is killed in a US drone attack in Pakistan's Baluchestan province. 2016 July - US President Barack Obama says 8,400 US troops will remain in Afghanistan into 2017 in light of the "precarious security situation". NATO also agrees to maintain troop numbers and reiterates a funding pledge for local security forces until 2020. 2016 August to October - Taliban advance to the outskirts of Lashkar Gah, the capital of Helmand, and to the northern city of Kunduz. The group has brought much of the two provinces under its control since the bulk of NATO forces withdrew by end of 2014. 2016 September - The Afghan government signs a peace agreement with the militant group Hezb-e-Islami and grants immunity to the group's leader, Gulbuddin Hekmatyar. 2017 January - A bomb attack in Kandahar kills six UAE diplomats. 2017 February - Rise in Islamic State activities reported in a number of northern and southern provinces. 2017 March - Thirty people are killed and more than 50 wounded in an attack by so-called Islamic State on a military hospital in Kabul. 2017 June - Islamic State militants capture the mountainous region of Tora Bora in Nangarhar province, which was formerly used as a base by the late al-Qaeda leader Osama Bin Laden. 2017 August - US President Donald Trump says he's sending more troops to fight a resurgent Taliban. 2018 January - Bomb-laden ambulance explodes in Kabul, killing more than 100 people. It is one of ongoing attacks attributed to the Taliban. Ahmad Shah DURRANI unified the Pashtun tribes and founded Afghanistan in 1747. The country served as a buffer between the British and Russian empires until it won independence from notional British control in 1919. A brief experiment in democracy ended in a 1973 coup and a 1978 Communist counter-coup. The Soviet Union invaded in 1979 to support the tottering Afghan Communist regime, but withdrew 10 years later under relentless pressure by internationally supported anti-Communist mujahedin rebels. A civil war between mujahedin factions erupted following the 1992 fall of the Communist regime. The Taliban, a hardline Pakistani-sponsored movement that emerged in 1994 to end the country's civil war and anarchy, seized Kabul in 1996 and most of the country outside of opposition Northern Alliance strongholds by 1998. Following the 11 September 2001 terrorist attacks, a US, Allied, and Northern Alliance military action toppled the Taliban for sheltering Osama Bin Ladin. In late 2001, a conference in Bonn, Germany, established a process for political reconstruction that included the adoption of a new constitution and a presidential election in 2004, and National Assembly elections in 2005. On 7 December 2004, Hamid KARZAI became the first democratically elected president of Afghanistan. The National Assembly was inaugurated on 19 December 2005. About the size of the U.S. State of Texas, most of Afghanistan is a rugged, inhospitable mountainous landscape. More than 50% of the total land area lies above 6,500 ft. (2,000 m). It all culminates in the high peaks of the Hindu Kush, where extensions of the Pamir Mountains, Karakorum Mountains and the Himalayas all come together. In the north a fertile plain fronts the Anu Dar'ya River. In the south, below the mountains, rolling desert and scattered salt flats cover the land. Afghanistan is drained by numerous rivers; significant ones include the Amu Dar'ya, Hari, Helmand, and the Kabul - directly east of the capital city, flowing down into the Indus River in Pakistan. In 1803, a German pharmacist, F.W. 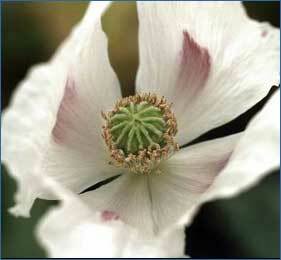 Sertürner isolated the main alkaloid of opium and named it morphine after Morpheus, the Greek god of dreams. Morphine was soon widely used for medical purposes in Europe and the U.S. But by the end of the century, addiction to the drug had become a problem. In 1898, while searching for a non-addictive substitute for morphine, Heinrick Dresser, working at the Bayer Laboratory in Germany, developed diacetylmorphine. Bayer marketed it under the brand name Heroin. The new drug, however, turned out to be up to ten times more potent than morphine. Opium poppies may look like innocent flowers out of a painting by Henri Matisse, but deep within their pods lies a substance that can be processed into heroin, a highly addictive drug used by 13 million people worldwide. 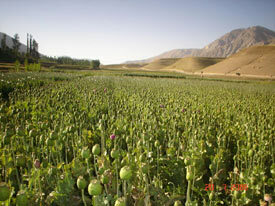 In wartorn Afghanistan, opium poppies can be grown easily and bring in much-needed cash. But growing poppies is just the start. Before poppy pods can hit the streets as "junk," "horse" or "smack" (or as their chemical cousins, opium and morphine), they must undergo a long and complicated refining process. Papaver somniferum, one of the few species of poppy that produces opium, is an annual plant with a growth cycle of 120 days. Farmers plant seeds, which range in color from white to yellow to brown and gray, in shallow holes. Within six weeks a cabbage-like plant emerges. It takes eight weeks for the poppy plant to grow about one to two feet. Each poppy has one long primary stem with secondary stems called tillers. As the plant continues to grow, a bud develops at the tip. After 90 days, the bud blossoms into a flower with four petals in a variety of colors. The petals fall away to reveal a green pod or ghozah that will continue to grow to the size of an egg. Inside the pod is the ovary that produces opium. Opium, which contains over 50 types of alkaloids including codeine and morphine, is only produced during the ten to 12 day period when the pod is ripening. Once the pod reaches maturity, the alkaloids in the opium are no longer made. chief of mission: Ambassador (vacant); Deputy Ambassador Francis J. RICCIARDONE, Jr.
Afghanistan's economy is recovering from decades of conflict. The economy has improved significantly since the fall of the Taliban regime in 2001 largely because of the infusion of international assistance, the recovery of the agricultural sector, and service sector growth. Real GDP growth exceeded 7% in 2008. Despite the progress of the past few years, Afghanistan is extremely poor, landlocked, and highly dependent on foreign aid, agriculture, and trade with neighboring countries. Much of the population continues to suffer from shortages of housing, clean water, electricity, medical care, and jobs. Criminality, insecurity, and the Afghan Government's inability to extend rule of law to all parts of the country pose challenges to future economic growth. It will probably take the remainder of the decade and continuing donor aid and attention to significantly raise Afghanistan's living standards from its current level, among the lowest in the world. International pledges made by more than 60 countries and international financial institutions at the Berlin Donors Conference for Afghan reconstruction in March 2004 reached $8.9 billion for 2004-09. While the international community remains committed to Afghanistan's development, pledging over $57 billion at three donors' conferences since 2002, Kabul will need to overcome a number of challenges. Expanding poppy cultivation and a growing opium trade generate roughly $3 billion in illicit economic activity and looms as one of Kabul's most serious policy concerns. Other long-term challenges include: budget sustainability, job creation, corruption, government capacity, and rebuilding war torn infrastructure.